TUI has been told off by advertising authorities for promoting a 'summer' deal that actually only applied to September and October. 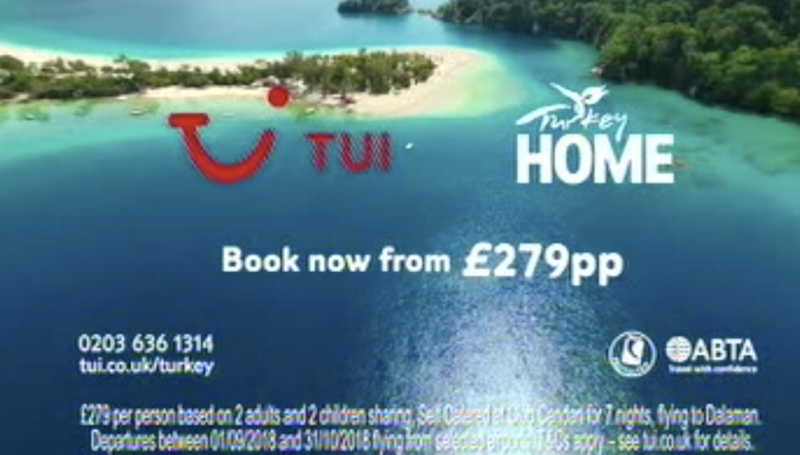 The TV ad, seen on June 3, featured a voice-over which said: "It's not too late to discover Turkey with TUI from £279 per person this summer. Perfect summer holidays that put you in the middle." The text on screen said: "Departures between 01/09/2018 and 31/10/2018 flying from selected airports." A complainant challenged whether the ad was misleading because it didn't actually apply to the summer. In its defence, TUI UK said its summer holiday period runs from April 1 to October 31 and said the advert showed both adult-only groups as well as families. Clearcast, the ad clearance organisation, said all qualifying information was clearly spelt out in the ad and argued that the first two weeks of departures were still within summer months. But the Advertising Standards Authority ruled the ad was misleading and shouldn't be run again. It said that in the context of an ad that showed family oriented groups, consumers would interpret the term 'summer holidays' to mean June, July and August. "We did not consider that a travel period of September and October only was likely to align with consumers' understanding of the term in the context of the ad," it said. "We told TUI UK Ltd to ensure that their future advertising did not mislead by claiming to offer summer holidays if those holidays were outside of the period that consumers were likely to consider as summer."